Use one of these free pajama pants patterns to make yourself a pair of pajama pants that fit just right. It's an easy sewing project for the beginner sewist and you'll have them done within an hour or two. You'll use your own measurements or a pair of pajama pants you love so you can get the fit just right. You'll be able to make a pair of pants that are comfortable around the waist and are just the length you want. There are many different styles available for both women, men, and kids. There are also several waistband options and fun add-ons like pockets and decorative trim. This free pajama pants pattern features an elastic waist with shirring in the back and a decorative tie in the front to make them both pretty and comfortable. Voile can be used for an extra soft touch but the pattern will also work with cotton fabric. This tutorial walks you through taking your measurements and making a pattern so you can create custom fit pajama pants. 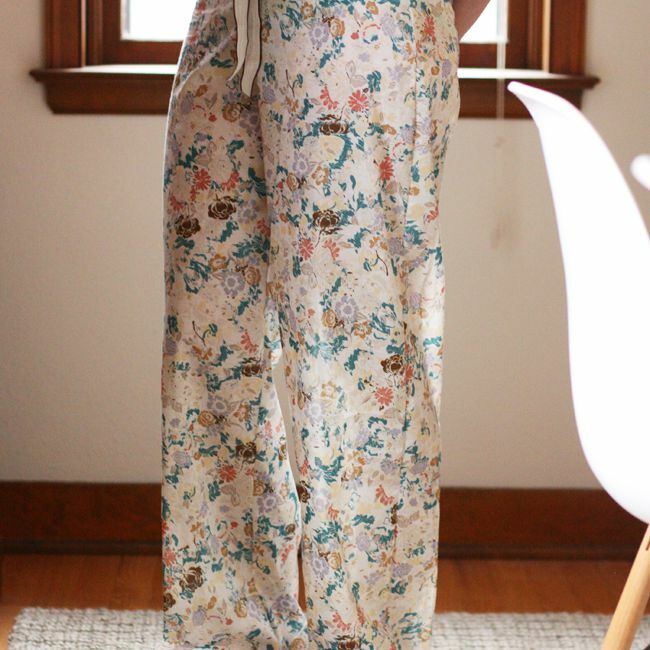 A vintage flat sheet is used as the fabric for these pretty pajama pants that you can whip up in an afternoon. You'll use a pair of PJ pants you already have to create a pattern just your size. Here's a pajama pants pattern available in a PDF that fits sizes XXS through XXL. Just measure your waist and hips and choose which size you need from the pattern chart. The waist is both made from elastic and a knit fabric to make it extra comfy. This pattern allows for you to add pockets if you prefer, too. There's also a pajama shorts pattern available. This DIY pajama pants pattern for kids will take less than an hour to make. It's a simple pattern, with an elastic waist and hemmed legs. You'll use an existing pair of kids pajama pants to make your pattern. These pajama pants are actually yoga pants but they are most definitely comfortable enough to sleep in or lounge around the house. There's a free PDF pattern for the yoga pants that includes measurement tables, cut lines for different sizes, a cutting diagram, and assembly instructions. Here's a free pattern for men's pajama pants, although you can size them down and they'll work for women as well. There are lots of options for the pattern, including regular and low-rise waist, side seam pockets, cut lines for pants, shorts, and capris, and optional drawstring and trim accents. These are made out of soft knit fabric and have a yoga waistband and cuffs for just the right fit. The downloadable pajama pants pattern is only available in one size but you can make slight adjustments to the pattern to get your size. For this pattern, you'll need an existing pair of sweatpants to create the pattern pieces for your pajama pants. These pants feature an elastic waistband, ankle cuffs, and even pockets. This free pajama pants pattern is available in small, medium, and large. It has a drawstring waistband and sews together in no time. Create a custom pair of pajama pants for your child using this free pattern that includes cutting and sewing directions. An elastic waist makes them extra comfy. Download this pajama pants pattern so you can make these pants that have a wide leg and yoga waistband. They're available in sizes XXS to XXXL and all measurements and pattern pieces are included.